The annual “Starbucks for Life” promotion is back as every holiday season, running at Starbucks until January 8 in 2018. You have to first manually accept the terms of the offer and connect it to your Starbucks account. This promotion gets you plays and rewards based on your purchases and various challenges you complete (eg, buy X items on Y days). A good opportunity to try the new Starbucks Holiday menu is a new after 2pm local time promotion they pushed to customers. As usual, you must first activate the offer on the web or using their app. Once you do, you earn bonus stars depending on how many days you visit in a row after 2pm local time between November 14-20 in 2017. That’s Tuesday AM until Monday PM of next week. Remember, this particular offer is not number of transactions, but rather number of days in a row you visit. So you have to be there every day to make the most of this. The way the promotion is structured, five days in a row gets you the most bonus bang for your buck. Running in parallel with the Holiday drinks promotion, Starbucks Rewards members may have another offer available for them. You have to check your email or app and first activate the offer before you earn the bonus. It’s a fairly simple and easy to do dash. 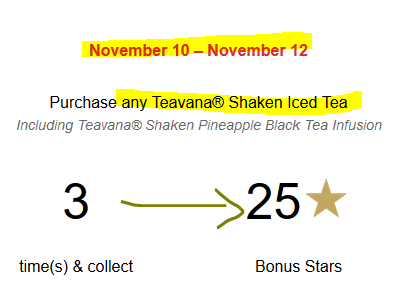 You buy three Teavana Shaken Iced Teas between November 10-12 in 2017, and you get 30 bonus stars, in addition to the regular stars of the purchase amount. The Holidays are coming in faster than the speed of light! 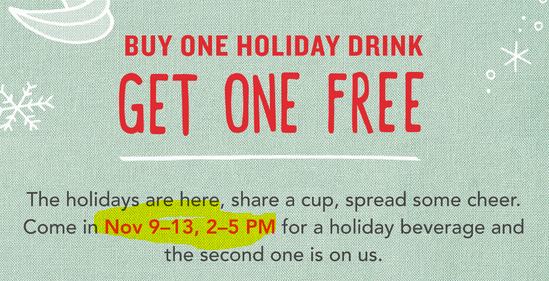 The official Holiday drinks have arrived at Starbucks stores, and between November 9-13 in 2017, between 2-5pm local time, they have a “Buy One Get One FREE” promotion on all the Holiday drinks. No coupon is needed. But both drinks must be one of the half a dozen eligible drinks under their holiday menu. 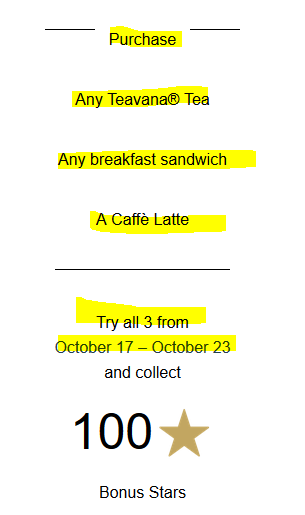 Regular mocha or latte drinks are NOT eligible. But that’s not all! 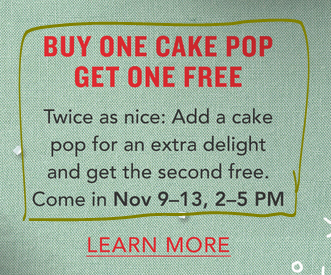 Hidden below the high profile BOGO offer on the drinks, they also have a BOGO offer on the holiday peppermint Cake Pop, along with the Snowman shaped sugar cookie! They go for $2 and $3 respectively each, so with the BOGO, $2 get you two cakepops, or $3 get you two snowman sugar cookies. Just like the drinks, only the designated holiday menu cakepop and sugar cookie is eligible. You cannot mix and match with regular menu items. You must needs buy two of the same holiday pop or cookie! 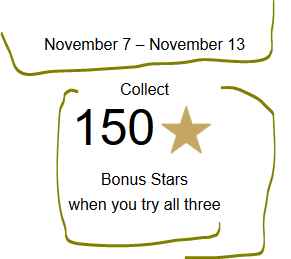 If you are participating in the Starbucks Rewards program, check your email for a new and pretty good offer! 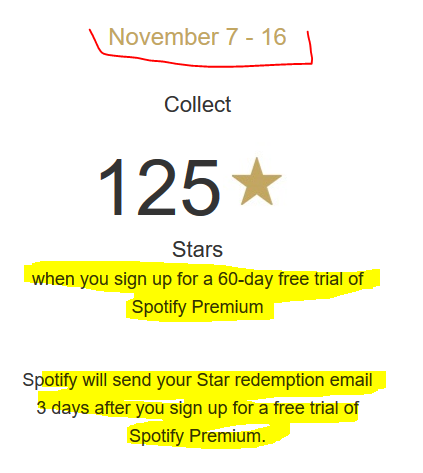 If you start a free 60-day trial of the Spotify Premium music subscription service, you will receive 125 Starbucks Rewards stars as well. That’s the equivalent of one full reward, which you can redeem at Starbucks for almost any item of any available size in the store. The Spotify Premium free trial will convert to a $10/month subscription if you don’t cancel it before the free trial expires, so keep that in mind! 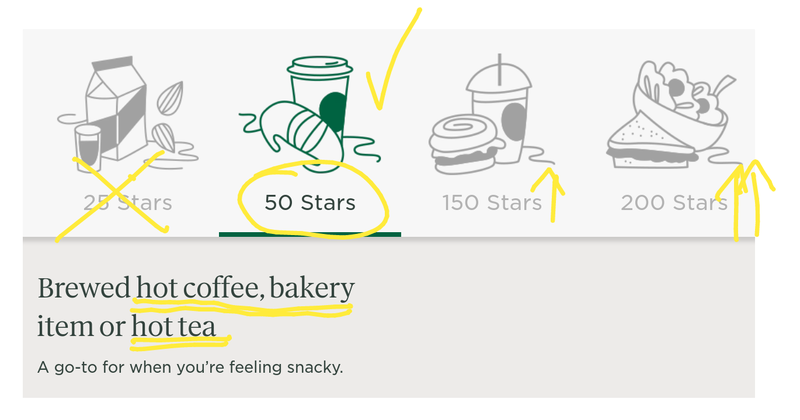 This promotion is probably only of interest if you frequently buy food at Starbucks. Otherwise it would be too expensive to do just to get the bonus stars. This is another offer that requires activation, so it is YMMV. Check your emails or the Starbucks app to see if their AI Bots invited you to participate. 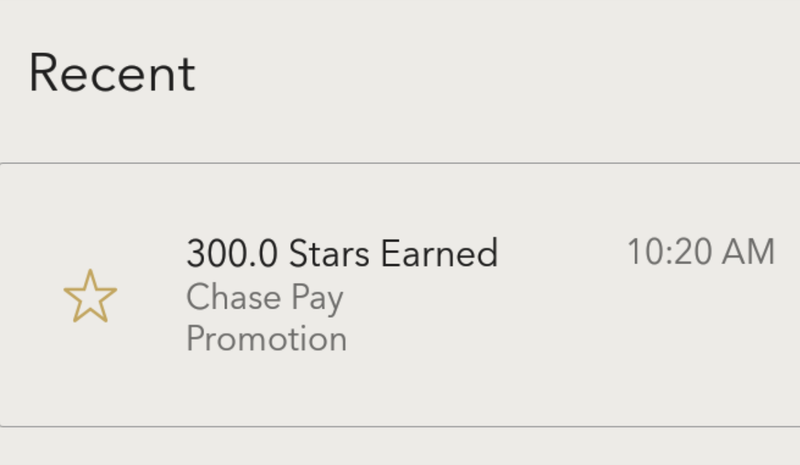 Another new “After 2pm local time” Dash promotion is running at Starbucks Rewards. 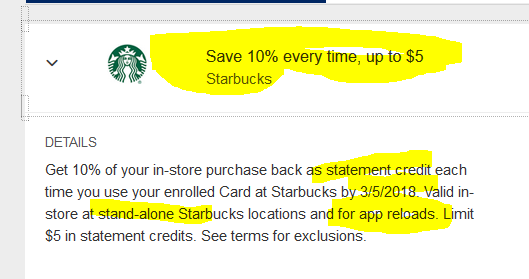 You have to manually activate this offer by web browser or the Starbucks app IF you have been invited by their computers to participate. 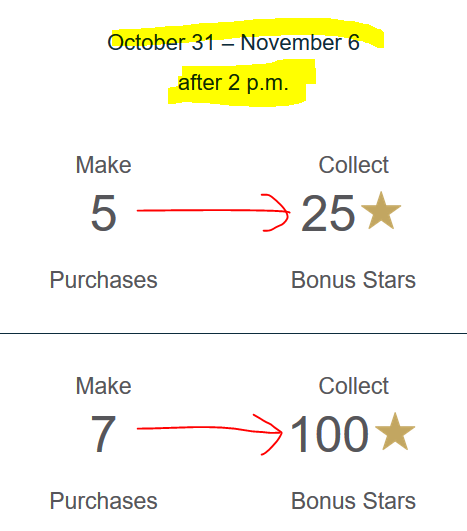 Once you do that, if you make five purchases during the promotion period of October 31st until November 6 in 2017, you will earn 25 Bonus Stars, but the real reason to participate in this promotion is the top of the promotion, if you make seven of more purchases, you get 100 bonus stars, which are 80% towards a reward. So those extra two purchases are a jump of 75 in reward stars! This is a separate transactions promotion, not a consecutive visits in consecutive days promotion. This is a very easy dash to complete, if you have been invited to participate either by email or within the Starbucks Rewards app. 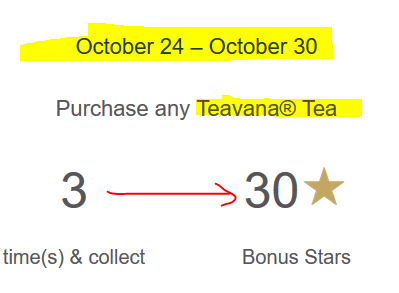 After opting in / activating the offer, all you have to do is buy any three Teavana between October 24-30 in 2017 (start and end dates included), and you’ll get 30 bonus stars, which are 24% of a full reward. You will also earn the normal reward starts on the purchase price of the three teas. 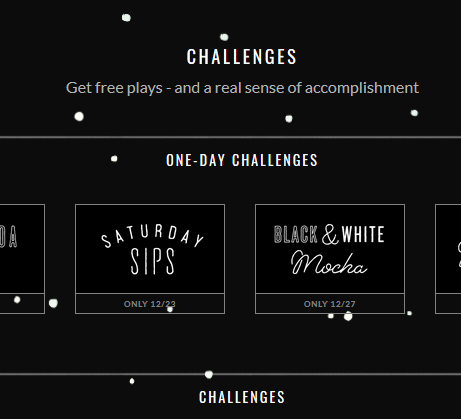 Better yet, you can combine the above purchases with some of the challenges in the Starbucks BINGO, so you can get checkmarks on both promotions with the same purchase. For example, if you plan a big $12+ purchase that coincides with the time period of the $6+ purchase, then you’ll get both of those covered. And if that order includes a tea, you’ll get a checkmark on this offer too! Starbucks is back with another “Join the Challenge” type of a Rewards promotion for its members. 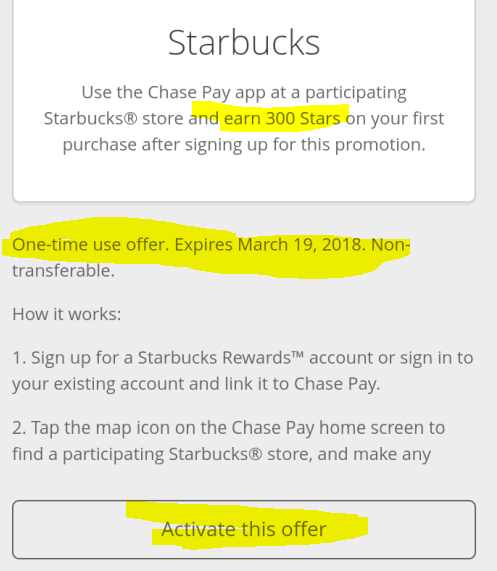 As with previous “Join” offers, you must first activate the offer on your account using the link in their email or the appropriate place in the Starbucks app (not all offers are shown in the app though). You must buy one of each, but not in the same transaction. They can be purchased on different days during the promotional period. 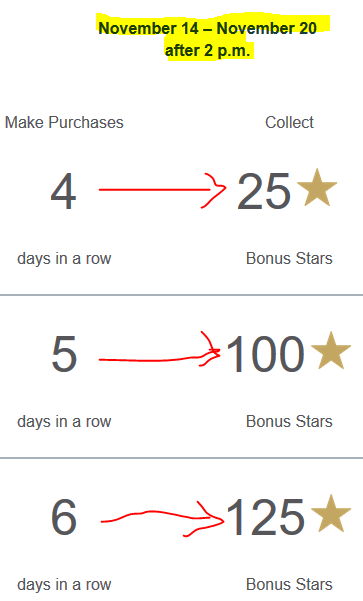 You’ll only receive one 100 Bonus regardless of how many you buy; eg, if you buy three of each, you’ll still receive 100 bonus stars, not 300.